If you know anything about Google's messaging strategy in the last few years, you know that it's been a bit of a mess. Allo, the consumer app, launched without the cross-platform features users expect. Text messaging on mobile is mired in inter-carrier warfare. And Hangouts has become a punchline. On two of those fronts, Google has been making progress. And today, in a bit of a surprise, Google has signaled that it finally decided Hangouts is supposed to be: a business communication tool to complement its consumer apps. We're now getting a glimpse of what that means — and if the early demo I saw is any indication, it might be time to stop making fun of Hangouts. That's because Hangouts is turning into a group chat system that looks a hell of a lot like Slack. Like Microsoft, Google is launching a Slackalike — and like Microsoft, it's betting that deep integration with the rest of its office suite is going to be catnip for IT managers and cost-conscious CFOs. Hangouts Chat will still offer direct one-on-one chats, and it will also still work natively on the web, Android, and iOS. But the new group chat rooms — which also offer threaded messages — are perhaps the biggest move the app has made since its launch in 2013. The core features of Hangouts Chat play on Google's strengths. It's deeply integrated into Google Docs and Sheets — and can assign document permissions automatically based on the team that created them. As you might expect, Google is also touting the search features inside the app. It will let you filter by rooms, people, file types, or even links that were dropped in the room. Google is also launching with some extensibility options: users will be able to create "app scripts" to have bots do work inside the chat, and it will allow third-party companies to create apps that integrate with Hangouts Chat. Google is using that feature itself, creating a bot it calls @meet that can look at the schedules of anybody in a group chat and automatically suggest a meeting time — then schedule it directly in Google Calendar. Will it compete feature for feature with Slack (or even Microsoft Teams) at launch? Perhaps not — but it doesn't have to in order to be a big improvement over Hangouts today. More importantly, it could be a minimum viable product for a lot of businesses that use Gmail and Google Calendar but don't want to pay for Slack. In tech, Good Enough combined with You're Already Paying For It has a way of ending arguments that a feature comparison can't. Google tells me that when it becomes generally available (right now it's only available to businesses in the Early Adopter Program), some of the business features will be limited to G Suite users. 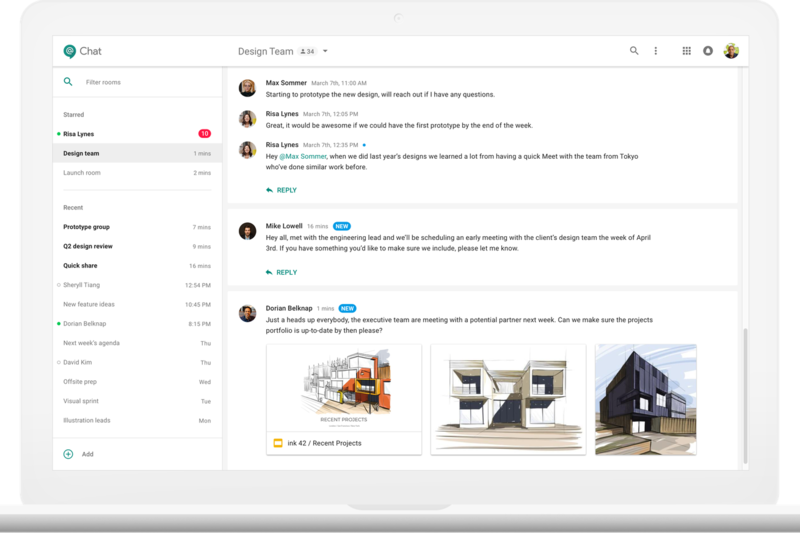 For regular old Gmail users, when it becomes available Hangouts Chat will follow a "fremium" model — which means that anybody will be able to download and try it out, but we don't know for sure what features will cost money. Speaking of meetings, Hangouts Chat will integrate with a big upgrade to the Hangouts video chat service, now dubbed "Hangouts Meet." (Yes, the naming is confusing and dumb.) Google says that the new video chat will be much less likely to spike your processor or grind your computer to a halt. The lighter-weight version of the app apparently means that up to 30 participants can join. There is no need to install a plugin on Chrome or Firefox, though both Microsoft Edge and Apple's Safari will still require one until they buck up and support the Web RTC standard. 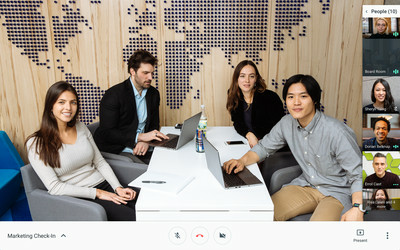 More importantly, though, setting up a video meeting should be a lot easier going forward: guests who aren't on the invite (or who happen to have clicked into the meeting) will be able to "knock" and ask to join more easily. Enterprise customers will also get a dial-in number automatically — no third-party plugin required — and tapping the calendar entry from an iPhone or Android phone will open up the phone app with the number and the meeting ID ready to dial. Initially, Hangouts Chat will only be available to companies in Google's "early adopter" program, and it's not clear which features will cost money and which ones won't — but we expect it will be available to all G Suite users and we know it will be generally available to all Gmail users in that "fremium" model. What is clear is that an app that's essentially been flailing for years finally has a north star: corporate collaboration. Google Hangouts has been having an identity crisis ever since Google tried to relaunch it as an end-all, be-all replacement for Gchat. It's been ping-ponging between Google Plus, business video chat, Google Voice, Project Fi, SMS, and lord knows what else. Focusing on business chat seems like a better strategy — and thankfully one that doesn't feel beholden to some other Google product with a dubious future. 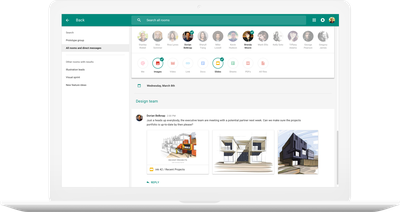 Hangouts is fully a Google Cloud / G Suite product now, and it will be developed for those users. For holdouts who were hoping Google would just turn Hangouts into its straight-on WhatsApp / Facebook Messenger competitor, this direction might be a small disappointment. But at least it's a direction. This story was updated at 2:28ET on March 9th to reflect general availability of Hangouts Chat to regular Gmail users.